There are a few additional requirements to consider when selecting cubicle hardware to install onto a Glass Door (as opposed to Compact Grade Laminate), as although the glass will have either been hardened or coated in a protective layer in preparation for its designed use, it is still naturally a more fragile material and so requires protective measures to be put into place to prevent breakage. 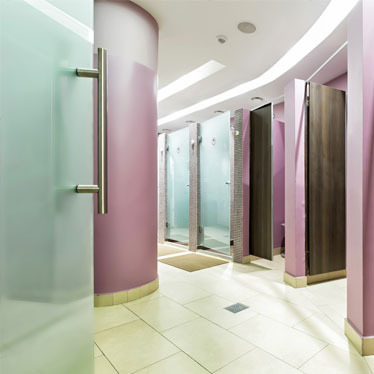 It is worth noting that glass cubicle doors are typically manufactured following the purchase of cubicle hardware, as the glass needs to be drilled to the relevant product specification during the manufacturing process to minimise the risk of breakage on fitting, so be sure to take this into consideration before ordering! Insulators are used in areas where direct contact would usually be made with the surface of a door or partition, to ensure that any metal components do not make direct contact with the glass. For example, buffers are perhaps most commonly inserted behind the keep and nylon patch plates in conjunction with cubicle legs. It is advisable to check with your supplier if the insulators required are included with the products you have selected, as some products may be suitable for a number of materials and for this reason insulators may need to be ordered separately, to enable your cubicle hardware to be safely fitted onto a glass surface. For an introduction to cubicle hardware why not check out our 4-part blog, starting with a guide on how to Install Cubicle Hardware?